There’s something to be said about getting the biggest subwoofer that you can possibly stuff into your trunk, and letting it loose with a giant amplifier. But do you really need the same size sub you’d have in a huge home theater, for your small vehicle? We’re making a few small assumptions with some of these recommendations, namely that you are looking for some excellent bass to round out your favorite music in the car, but you aren’t looking to go completely overboard or to spend a fortune. Generally speaking, if you wanted to invest a lot and to get competition SPL, you would be looking at something larger than a 10”. That doesn’t mean you can’t produce some seriously powerful and deep bass with a 10 inch subwoofer, it’s just not going to be on the same level as something a lot larger and more expensive. With that out of the way, here are some incredible options that’ll get that bass pumping, without waking up everyone within a three block radius. Makes it as easy as possible for people to get into higher-end car audio without spending a fortune or getting discouraged. Getting dual subs gives you more oomph compared to having just one. 1 Best 10 Inch Subwoofer Reviews – Which One Is Right For You? 2 Are two 10 inch subwoofers better than one 12 inch subwoofer? Best 10 Inch Subwoofer Reviews – Which One Is Right For You? If there was an “easy-mode” for bringing some bass into your life, this would be it. You get the advantages of having dual subwoofers, without a huge footprint or any major commitments to totally overhauling your car. It’s a step-up in sound quality from some of the low-profile subwoofers we’re about to look at, but still easier than buying everything separately. This combo deal from MTX ties up all the loose ends for you, and takes all of the guesswork out of buying and building a subwoofer. It includes a pre-made enclosure that’s tuned correctly for the equipment inside of it, which is one of the most challenging aspects of going the DIY route instead of this. You don’t have to worry about getting the right enclosure, or matching your subs to your amplifier, it’s all done for you. For somebody who is just starting to dip their toes into car audio, or just wants a simple solution that they can circle back to down the road if they decide they want something more powerful, this is probably a perfect starting point. But don’t let that sell it short, either, these dual 10 inch subs can bump. The 400w RMS power is on the lower side, with 800w peak and 1200w max, but it’s still plenty to power these two smaller subs. It’s not the most powerful package out there compared to some of the others, but don’t worry - it will still rumble, shake, and rattle your soul if you haven’t had a bigger subwoofer in the past to compare it to. Make no mistake, this isn’t a subwoofer that’s going to get you noise complaints from the other side of the city, but for what it is and what it’s meant to do, it does a great job. This is meant to be a dead-simple, affordable way to get some extra bass in your car, because without a subwoofer you simply aren’t hearing what you should be hearing. This sub helps round out the frequencies for you and absolutely gives you some solid bass, it’s just not going to move mountains. Similar to the first product on this list, this one also comes with everything you need to get started, except in this case it’s all built into one smaller box, rather than having a seperate amplifier. It’s great if you’ve got very limited space and aren’t willing to sacrifice your trunk to bass, and don’t want to mess around with a lot of tuning or having to build anything. The lack of a proper enclosure absolutely has an impact on sound quality, and how much you’ll feel the bass. You’re making some sacrifices for the smaller form factor, so if huge bass is your top priority, then you’ll want to look elsewhere. But if you’re looking at 10 inch subs in the first place, this type of product can be very appealing for someone who knows their stock audio has practically zero bass, and wants to upgrade from that but also wants it to be quick, easy, and affordable. For the people who fit the aforementioned use case, this is a perfect solution. If you have a more trained ear, you probably won’t be super impressed with the sound quality, and you’ll want to look for a more traditional sub with an enclosure and a seperate amp. You can slip this in under your seat, behind your seat, in the trunk… which gives you a lot more flexibility compared to having a big full-size enclosure to try to stash away. Easier to setup and install than an enclosure-style subwoofer. It’s still a huge, night-and-day upgrade over stock audio. Bass isn’t as deep as other subwoofers. You’re definitely making a compromise in order to have such an affordable and easy-to-setup unit. This is a step-up from the super low-profile options out there and can give you some deeper, fuller sound but still offers the convenience of a built-in amplifier. All you’ve got to do is add a couple of wires, and you’re pretty much all set. This is a perfect entry-point for someone who wants much, much better sound in their vehicle without going off the deep-end. If the convenience and ease of the previous subwoofer (Sound Storm LOPRO10) caught your eye, but you want something that’s going to get deeper and louder, the P300-10 by Rockford Fosgate is the perfect step up. It’s bigger, so it’s not meant to hide right under or behind your seat, but it’s still an all-in-one where the subwoofer, the enclosure and the amplifier all come together, perfectly setup right out of the box, so you don’t have to do any calculations or worry that you aren’t getting optimal sound. It can hit as low as 35Hz, and the larger enclosure is going to give you much better quality than some of the small flat under-seat subs, as long as you’ve got the room for it. This is the perfect choice if you don’t want to get your sub, enclosure, and amplifier all separate and piece them together, hoping they’re all compatible, and hoping you can get them tuned nicely. Going this route does give you a lower ceiling when it comes to upgrades, compared to having all of your equipment separate, but if you aren’t looking to upgrade and expand, and you just want some killer bass in your car without making it into a whole big project, you’re all set with the P300-10. You’ll still need to wire this unit in (ground, source, and power) but it’s a lot simpler than putting it all together from scratch. Surprisingly good sound quality considering the size and convenience of this package. Makes high-end audio much less intimidating for people who want great sound in their cars without dedicating their lives to a new hobby. Still not quite up to par with a big enclosure, a super-powered amplifier and a high-end subwoofer… but also not that far off for the average listener, either. If you’re looking for incredible bass in your vehicle with versatility, without having to build your own subwoofer enclosure and measure it all from scratch, this is probably a perfect choice. Add an amplifier, some simple wiring, and you’re going to be absolutely blown away. Continuing the theme of trying to balance convenience and sound quality, here’s another step towards perfect sound and a small step away from convenience. In this case, the amplifier isn’t included, but you’re still getting the sub itself inside of a ported enclosure that’s all setup and tuned correctly, so all you’ll need to do is add your amplifier and wire it in. Adding an amplifier really isn’t that much more complicated than having an enclosure with a built-in amp, in the grand scheme of things. It’s an extra step to choose the right amp, but this particular sub has a nice feature that makes this all a bit easier. You can switch from 2 ohms to 4 ohms which gives you more versatility and options to expand or change your setup down the road. It peaks at 1000w and runs at 250w RMS, so it’s not a total world-shaker but just to reiterate, people looking for 10 inch subs just want something that’s going to sound amazing in their cars, they’re usually less interested about making sure that everyone else in a 10 mile radius can also hear their bass. Pairs nicely with a decent amplifier to give you very surprising bass from a relatively compact unit. Switching from 2 to 4 Ohms is a very welcome feature to have, even if it doesn’t matter to you right off the bat. You can find 12” subs in similar sized enclosures, so if size is a concern and you want more bass, that could be an option. There are so many excellent active 10 inch subwoofer packages out there that it can be hard to choose. This one doesn’t pack the most power in the world, but it still rumbles and growls better than you’d expect from something this size. The big question people have is whether it’s worthwhile or not, and for the price, it’s definitely worth it – you just need to realize it’s obviously not going to compare to larger, more expensive choices. 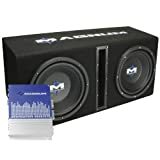 Here’s another affordable active subwoofer (powered, no need for a seperate amplifier) with a very low-profile that can fit under or behind your seats, or just about anywhere else in your vehicle. It can hit 800w peak power, 200w RMS, so it’s not going to be cracking windshields or annoying neighbors and other drivers. A lot of people don’t want to disturb others, and 10 inches is plenty of size to fill your vehicle with bass without going overboard. We’ve already gone over the advantages and disadvantages of slim, all-in-one subwoofer packages and all of those apply to this one as well. With any less-expensive gear, people wonder what they’re sacrificing by saving some money, and in this case it just comes back to the physics of not really having a proper enclosure, along with the smaller surface area of a 10 inch sub vs. a larger size, and it means you’re not going to get the same depth to your bass, and you won’t be able to hit the loudest volumes. At the risk of sounding like a broken record, some people really don’t care about that at all, and this is a perfect option for them to add some very decent bass to their commute. Could not be easier to setup and wire it into your vehicle. Surprisingly decent bass considering the size and price of this package. Just like the similar options, it’s not going to blow your mind, and won’t be good enough for any serious basshead. If you’ve been skimming this list thinking, “I don’t want the easy option, I want some killer bass,” it’s finally your time to shine. The P3D4-10 by Rockford Fosgate doesn’t come with an amplifier, it doesn’t come with an enclosure, you just get the 10 inch subwoofer itself and you’re responsible for the rest. You’ll need to build or buy an appropriate enclosure, you’ll need to get an amplifier for it, but in the long run it’s worth the effort. You can get one of these, or even two of them to slap inside a double-enclosure. That versatility, along with the ability to upgrade or replace the amplifier if anything goes wrong, or to replace the sub itself and pop a new one into your enclosure, is a major advantage compared to getting all-in-one units. Having separate components keeps the door open for upgrades and replacements, without having to replace the whole shebang. Granted, some of the all-in-ones are so cheap they’re more or less disposable, but you do pay a premium for the convenience and small form factor, both in terms of price and in terms of sound quality. The P3D4-10 is the answer to that, giving you everything you could hope for from a 10 inch subwoofer. It blows away all of the loaded subwoofers we’ve featured, if you don’t mind rolling up your sleeves and putting in the work to get it setup. It’s not “plug and play” like some of the others on this list, and if you’re going through all of that effort, you may want to consider something larger and more powerful. If you need a low-profile sub to fit into a smaller enclosure, this is a great option. Your choices are more limited when you have limited space, and this gives you the best of both worlds. If you need a smaller form-factor but still want to choose your own amplifier and enclosure, this is the subwoofer to buy. Here’s one more subwoofer where you just get the speaker itself, and you’ll have to track down your own amplifier and enclosure. In this case, it’s slightly different than the P3D4-10 we looked at from Rockford Fosgate, because this Pioneer product is designed to fit into a smaller enclosure. It’s a shallow-mount sub, so it’s not as deep in size, making it more versatile, but you do miss out on some of the punch you’d get from a full-size subwoofer. Remember, in the 10 inch size, there’s always a trade-off. This sub claims to hit as low as 20Hz, but that doesn’t mean it’s hitting 20Hz at a high volume. Pioneer doesn’t show a frequency response chart, but it’s safe to assume that the volume drops of drastically before it hits 20Hz. That’s to be expected, and we just wanted to give some context to those numbers, since they can be a bit misleading at times when you’re trying to compare subwoofers. If you can find something that hits 30-35Hz with high volume in your price range, it’ll almost always sound better than something that can go lower, but only at very low volumes. Perfect option if you need a slim sub to fit into a tighter space but still want the benefits of buying the subwoofer on its own. Pioneer are a leader when it comes to high-quality audio gear at value prices, and this sub is no exception to that. Doesn’t hit very hard at the lowest frequencies. Are two 10 inch subwoofers better than one 12 inch subwoofer? This is a common question, and for good reason. Chances are you didn’t set out specifically to buy a 10 inch subwoofer, but rather you’re just looking for the best option to get the best bass, but while still keeping things on the more practical side. In theory, you’re going to get more surface area with two 10 inch subs, compared to one 12 inch sub, so you’ll be able to move more air, and get better clarity and sound quality. Of course, there are so many variables that this isn’t always the case, but it holds up as a rule of thumb.